Beautiful, Private Cottage With All The Amenities! One Bedroom And One Bathroom. This beautiful, quiet, completely private cottage is right on Mill Creek, one block from downtown Kelowna, and one block from the gorgeous Lake Okanagan. It is situated in a protected heritage area right in the heart of Kelowna, but still a quiet, serene location with an abundance of trees and wildlife. The property features a private back patio overlooking the creek, a loft bed area with hardwood floors and a comfortable pillow top queen bed, full kitchen, tile floors, washer/dryer, dishwasher, cable, wireless internet, A/C, heating, driveway parking for one vehicle, breakfast bar, large closet, keyless entry, and more. The kitchen is fully stocked, and all towels and bed linens are provided. Big White and Silver Star ski resorts are both less than an hour away. 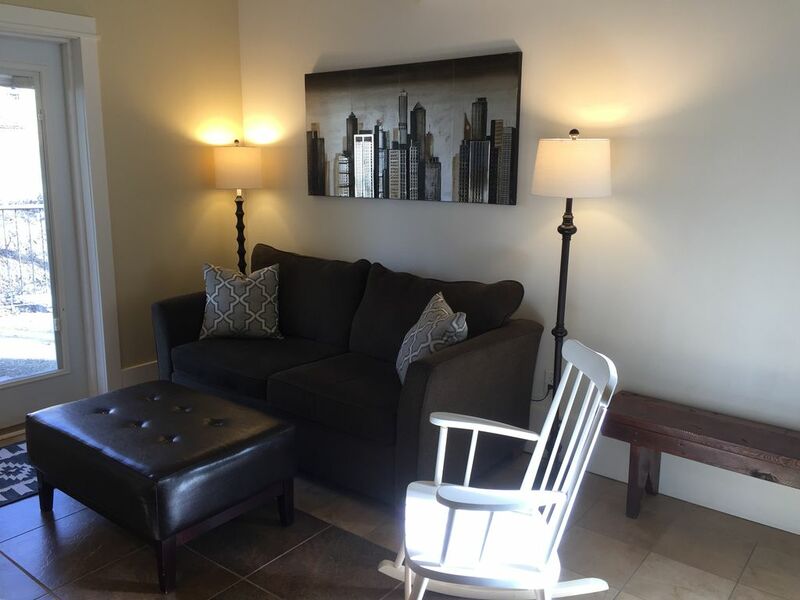 It's close to the hospital, beach, downtown, golf courses, tennis courts, parks, pools, wineries, boat rentals and slips, bike and walking trails, and just 20 minutes from Kelowna International Airport. There are plenty of shops, restaurants, and cafes all within walking distance. Public transit is close by, and there are shuttles from the airport. There is a pull out sofa and extra bedding available if needed. This beautiful, private cottage is just a block from downtown and Lake Okanagan beach. It's in the heart of Kelowna, but on a quiet street, so you'd never know how close you are to all of the action! There is a private creekside patio right out your back door. There are lot's of gorgeous old heritage trees by the water, and tons of wildlife to be seen! Beavers, chipmunks, squirrels, birds, & more! The location is wonderful, walking distance to everything in Kelowna. It’s a converted garage. Getting up to the loft is a bit sketchy. The river behind the property is misleading but the outdoor space is nice to have, would have been better with a BBQ. This Loft suite was perfect for us! It's within walking distance to everything downtown and provided plenty of room for the two of us. The owners graciously greeted us when we arrived and gave us plenty of privacy during our stay. I would highly recommend this location for your stay in Kelowna, and we will definitely be staying here again! Easy access to downtown and activities with helpful designated parking. The washer/dryer amenities were awesome for us since we did a lot of outdoor activities. We were there for a holiday weekend so there was a little noise from the youth hostel across the creek but the cottage itself was quiet, clean, and well equipped. Angela was responsive and helpful. Highly recommend this place! The neighbourhood is full of bike and walking trails, beautiful little beaches, parks, delicious restaurants, great shopping, and more! The Okanagan in known for wineries and golf courses, and there are a ton of them nearby! Kelowna has a very mild climate, so grape vines thrive here and the golf courses stay open for a good portion of the year. The cottage is located in a protected heritage area with many historic homes and mature trees.